To be honest, this is probably the most important thing that I’ve done in my life. I know it sounds dramatic, but I can’t help but think that it’s true. 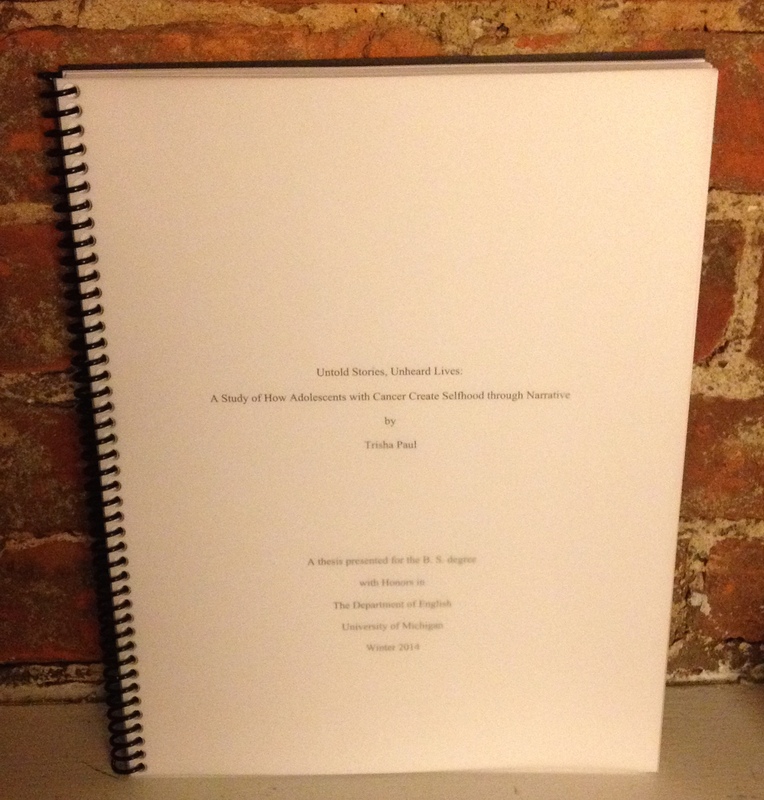 I’ve been excited about writing a thesis since coming to college. I had no idea what it would be about, but I loved the idea of turning my own thoughts into something new. My English teacher once told me that I was a seeker; I enjoy turning to literature for answers and embracing its ambiguity. And in many ways, that is what I’ve done in my Honors English thesis. It’s hard for me to wrap my mind around just how much of myself I’ve devoted to this research. But in many ways, this thesis is the culminating creation of my entire undergraduate education here at Michigan and more. Volunteering with pediatric oncology patients in high school initially piqued my interest; now, I’ve become dedicated to hopefully getting involved in childhood cancer as a physician. I needed to do this research: for these individuals with cancer who have had such an impact on my life but also for me, as a way of making sense of these unfathomable lives. These final days have also been a time for remembering how fortunate I am to have so many people in my life supporting me. A close friend willingly contributed an extra set of eyes and an additional brain towards the editing process. From front to back, my mom read my entire thesis for typos. My dad morally supported me in the final stretch, and even my brother helped me to perfect the images. It’s been humbling to watch my loved ones step aside from their lives and devote their time to my own project. Throughout the process, I’ve said that all I wanted was to be able to turn my thesis in knowing that I did everything I could and that I personally am happy with it. By my own standards, I believe that I’ve successfully accomplished this goal, and I couldn’t be more content. If nothing else, the fact that I found myself eager to write this blog post and excited to dive into John Green’s The Fault in Our Stars to celebrate says something to me. I know that in studying literature, I’ve truly been doing something I love.